It’s almost impossible not to feel a bit like royalty while staying at The King and Prince, and the holidays are a perfect time to experience this special place. The resort began in 1935 as a private dance club, only to become The King and Prince Hotel in 1941. The resort is on the National Register of Historic Places and a member of Historic Hotels of America. It’s a must-experience place that will make you want to come back again and again. The beauty of this trip was experiencing the transformation of the resort. The makeover is complete and it is a first-class transformation. The restaurant, Echo, gives a nod to St. Simons’ brief naval history during World War II when the U.S. Navy purchased the local airport in 1942 and established the Naval Air Station St. Simons. The King and Prince was in the center of it all as it housed officers, classrooms, and towers used to amplify the new radar signals. This “echo” became a heartbeat of the war’s impact on St. Simons Island. The present-day Echo, newly remodeled, serves classic coastal cuisine and handcrafted cocktails. The atmosphere is casual and friendly… perfect for drinks after a day at their new pool area or even a night out on the island. Executive Chef John Palacio, who sources what he can locally, created a delightful dinner the first evening of my stay: Fresh Arugula Salad, Wild Georgia Shrimp & Grits, and Chocolate Ganache Cake. The next morning, the breakfast table was a work of art, so beautiful the group hesitated to dig in — but the food was scrumptious. Chef Palacio had prepared the breakfast version of a low country boil for us, with shrimp and fresh sautéed vegetables, eggs, and the famous King and Prince muffins. Don’t miss breakfast at Echo’s. And don’t miss a chance to watch the sunrise over the ocean before you make your way to the culinary delight that awaits you. 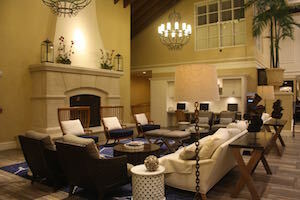 The remodeling of the lobby atrium includes a welcoming fireplace with comfortable and attractive furniture, perfect for great conversation with friends after a day exploring the island or a walk on the beach. The pool area also underwent a redesign and is impressive with three pools. You can spend the day outside swimming and lounging by the pool, even ordering lunch poolside. The rooms are beautifully appointed. The resort meanders along the coast, boasting rooms in the main, historic building, the North Villas, the South Villas, and several stand-alone buildings and houses with anything you need to meet the needs of your stay. Whether you choose to play a game of tennis or get a massage at the Royal Treatment Cottage, there is an endless list of experiences on site and around the island. And if golf is on your list, the King and Prince golf course celebrated 25 years in 2014 and is a must-play course for golf lovers. The Joe Lee-designed course includes four salt marsh island holes connected by 800 feet of elevated cart bridges. In 2009 noted golf course architect Billy Fuller led a full restoration of the golf course utilizing the original Joe Lee drawings. Fuller stayed true to the integrity of the original design while adding a few new bunkers and a fifth set of tees, and using four new grasses on the tees. The course is full of beautiful nature views and wildlife, adding to the wonderful experience of this amazing course. There are many amazing restaurants on the island. For a truly local feel, consider Southern Soul Barbeque, a casual place with benches outside. The restaurant has been featured on shows such as Diners, Drive-ins, and Dives. Don’t miss a visit to Palmer’s Village Café where you’ll find delightful locally-sourced dishes with a beautiful backdrop of local artists’ paintings. The art makes the café feel light and airy and it’s for sale if you find a piece you just have to have. While on the island, you simply cannot afford to miss a meal at the newest restaurant, Del Sur. Co-owners Fernan Stutzer and Chef Alberto Llano serve a rustic Argentinian/Italian artisan cuisine. Everything is made with love and care and some standout dishes include the short ribs, the polenta, and the homemade empanadas. 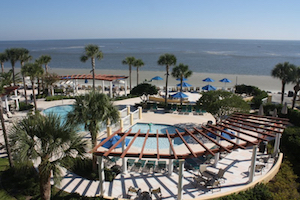 At the end of the day, The King and Prince Beach & Golf Resort, along with St. Simons Island, is worth experiencing. You’ll find yourself on island time in no time at all.